This easy dinner recipe is perfect for weeknights – full of protein, packed with the yummiest of greens, and ready in less than 30 minutes. 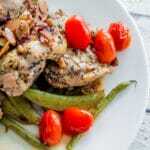 Chicken thighs, green beans, and a snap pea amandine, it even sounds delicious! In a large nonstick pan, heat a drizzle of oil on medium high. Season chicken with half the spice blend. Add salt/pepper to taste. Cook in pan, partially covered for 4-6 minutes per side until cooked through. Set aside. Add tomatoes to the pan, and season with remaining spice blend. Cook until they begin to burst (3-5 minutes) and remove all and set aside. Toast the almonds by adding them to a dry pan over medium heat, stir occasionally for 3-5 minutes until lightly browned and fragrant. Remove and set aside. In the (now empty) dry pan, heat a drizzle of oil on medium-high, add garlic and onions. Cook, stirring frequently until the onions become translucent; 1-2 minutes. Add green beans, sugar snap peas, and half the balsamic vinegar. Season with salt and pepper to taste. Cook (stirring frequently), 4-5 minutes until cooked through, but still crisp. Add the toasted almonds, and toss to combine. Divide chicken and vegetables on between plates to serve, and enjoy!